I took this recipe from “The Cookiepedia” by Stacy Adimando. These cookies are super easy to make, although I did have some challenges. 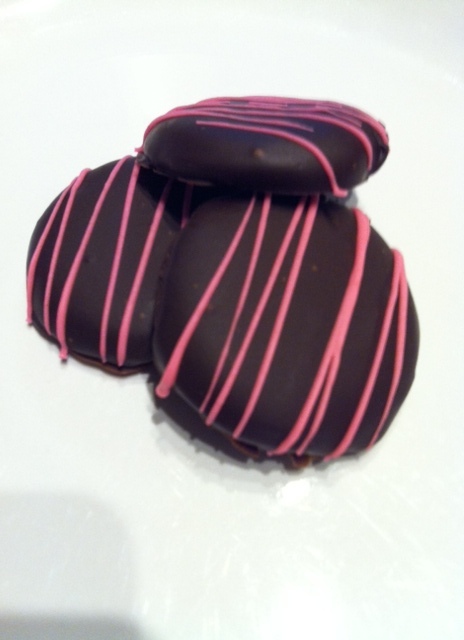 I had no issues making the cookies themselves since I made them ahead and froze them until I was ready to dip them in chocolate. I followed the recipe exactly, adding 12 ounces of chocolate, butter and peppermint. I came up with a huge fail! The chocolate clumped together and it wasn’t smooth at all. I came to the conclusion that possibly the bowl I used to melt the chocolate came in contact with the hot water. I tried again with less water, knowing that it was impossible for any contact to happen and the chocolate clumped AGAIN!! I’m not a huge fan of wasting food (especially 24 ounces of good chocolate!) Third time worked out like a charm…I eliminated the butter and all worked just fine! 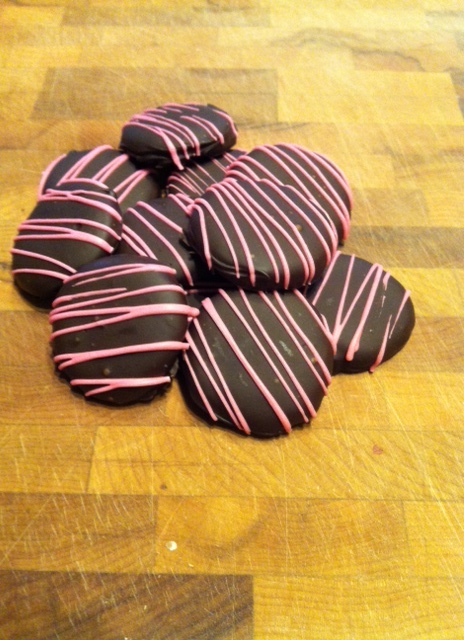 I drizzled my cookies in pink for an event I was making them for, but you can just leave them as is and they are just as delicious! 1. Preheat oven to 350F. Cream the butter until it’s light and fluffy. Add the powdered sugar and continue mixing, stopping to scrape the sides of the bowl as needed. Mix in the egg and vanilla extract. Sift together the flour, cocoa powder, and salt. Add the flour mixture by halves, beating to incorporate after each addition. 2. Turn out the dough onto a clean surface and form it into a disk with your hands. Split the disk in half and place them in the fridge to firm up for 1 hour. 3. Working on a floured surface (you’ll need a decent amount, since the dough is sticky), roll out the dough to 1/8-inch thick. 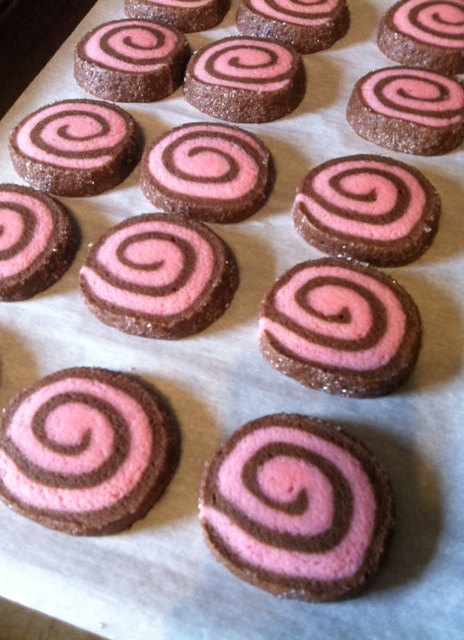 Shape the cookies using a 1 1/2-inch round cutter and place them on a parchment-paper-lined baking sheet. Bake for 10 to 12 minutes, then let cool completely. 4. Break up the chocolate into a bowl and set it over a small pot of simmering water (make sure the bowl doesn’t touch the water). Add the butter and the peppermint flavour and stir the mixture steadily until it’s fully melted and looks glossy and smooth. Remove the bowl and let the chocolate cool slightly. 5. One by one, drop the cookies in the chocolate, then scoop them out with a fork to let the excess drip off. (Tap the cookies against the side of the bowl to help drain the extra chocolate). Move them carefully to a wire rack or parchment-paper-lined baking sheet. When they’re all coated, move the sheet to the refrigerator or freezer to set. 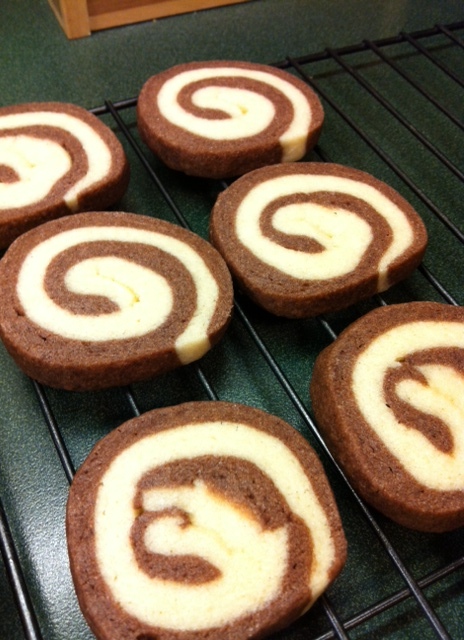 I love the swirling combination of the vanilla and chocolate in this easy to make cookie recipe. I took this recipe from “The Cookiepedia” by Stacy Adimando. Make sure you really tightly roll this cookie together, as you can see from my first photo that there are gaps in the middle of the cookies. I also made this recipe for an event. 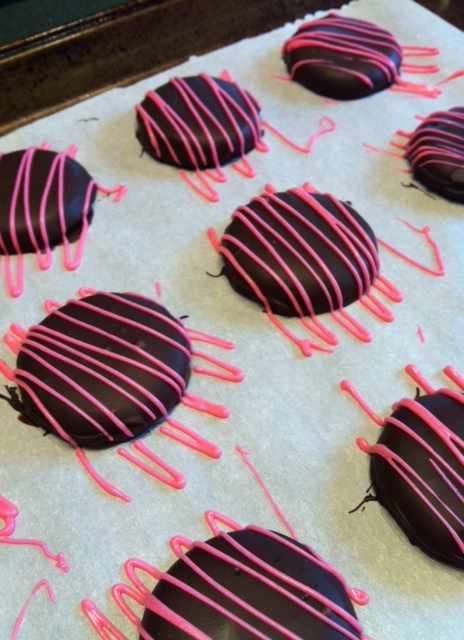 I was asked to make pink cookies. It was super easy to add food colouring to the vanilla dough. I also rolled the cookie roll in sugar before cutting it into cookies. 1. Preheat oven to 350F. Get to work sifting the flour, baking powder, and salt into a bowl. Set it aside for the moment. 2. Cream together the butter and sugar for several minutes, until light and fluffy. Add the eggs and the vanilla and mix until incorporated. 3. Start tipping in the flour a third at a time; stop mixing when it’s just combined. 4. When the dough forms, divide it into two parts. Reserve one half in plastic wrap and keep it in the fridge. Mix the cocoa powder into the other half using a spatula. Form the chocolate dough into a disk, wrap in plastic wrap, and chill both doughs in the fridge for at least 1 hour, until firm. 5. Roll out the dough to about 1/4-inch thickness, using just a little flour as needed. Move it to a large piece of parchment paper. Do the same with the vanilla dough, flattening them to around the same height and dimension. Place the vanilla dough on top of the chocolate and run a rolling pin lightly over the two doughs to press them together. Trim the doughs into a rectangle shape so they each have the same edges. 6. Starting at one of the short ends, carefully roll the dough up into a log, using the parchment paper to help. Wrap it tightly in plastic wrap or parchment paper and chill for at least an hour. Do the same with the reserved pieces of dough. 7. Line a few cookie sheets with parchment paper. Unwrap the log and slice it into cookies about 1/4-inch thick using a very sharp knife. Lay the cookies on the sheets about 2 inches apart. 8. Bake for 10 to 12 minutes, until you start seeing hints of the edges turning golden. Remove and let cool for a minute, then spatula to a wire rack.